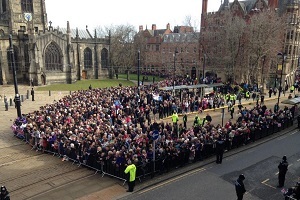 Sheffield Cathedral welcomes Her Majesty Queen Elizabeth II. Honoured to welcome Her Majesty Queen Elizabeth II to Sheffield Cathedral on her Royal Maundy visit - Maundy Thursday 2 April 2015. Read the story and view images from Her Majesty's Royal Maundy visit to Sheffield Cathedral.